Olympic heptathlon gold medallist Jessica Ennis spent much of 2013 as an unwilling spectator, but she’s in no doubt about the performances that caught her eye. 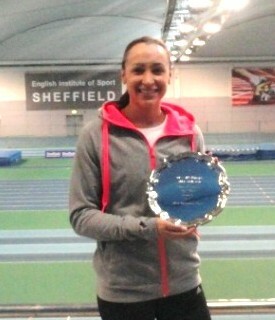 “You cannot look beyond Mo Farah,” the now Mrs Ennis-Hill said yesterday, as she was presented with the 2012 UEPS/AIPS sportswoman of the year trophy, voted for by our colleagues across Europe. “He has been absolutely incredible to back up what he did last year and then come out and do that all again,” said Ennis-Hill, the SJA’s 2012 Sportswoman of the Year. With injury as well as her wedding to deal with in 2013, Ennis-Hill never made it to Moscow to defend her heptathlon world title, though Christine Ohuruogu reprised her role of Britain’s golden girl by regaining the World Championship 400 metres title she had previously won in 2007. Ennis-Hill has won the SJA’s Sportswoman award three times in the last four years – and was in the top four on the one occasion she missed out on the trophy.So 2013 represents a significant gap in her competitive CV. Now, she’s targeting a return to action for the indoor season. “Having to make that difficult decision before the Worlds in Moscow was really disappointing, frustrating more than anything, but I knew it was the right decision. I had to give my Achilles time to heal and get into a full rehab programme. “I am quite a bit down the road now. It is so much better now, I had a scan on it the other week and it shows it is really healing well. In fact, the summer of 2014 could be a very busy year for Ennis, with the the Commonwealth Games at Hampden Park and the European championships in Zurich follow shortly afterwards. Win those two and Ennis-Hill will be back in the reckoning for the 2014 SJA British Sports Awards.